When offshore and out of the shipping lanes, good visibility ahead and behind (the latter to avoid being caught unawares by an overtaking ship). 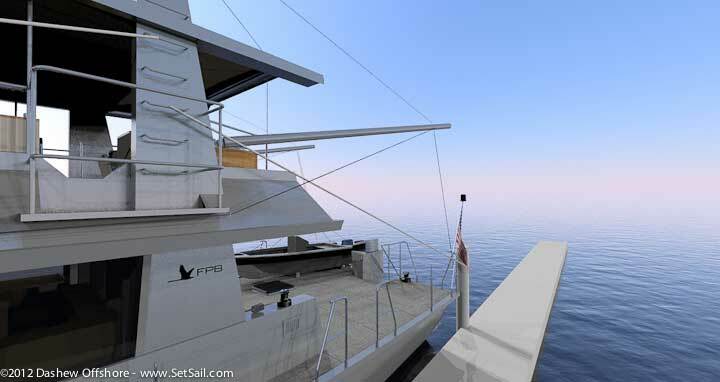 A secondary offshore position which allows the watch to relax, feet up on a couch, yet have a good field of vision. In traffic, especially with small craft, the ability to see close in under the bow. 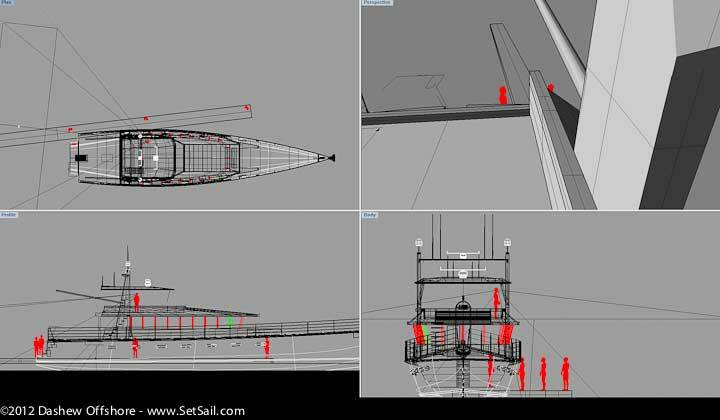 With ice and debris, sight lines to low floating objects, near enough the bow to be able to take avoiding action. 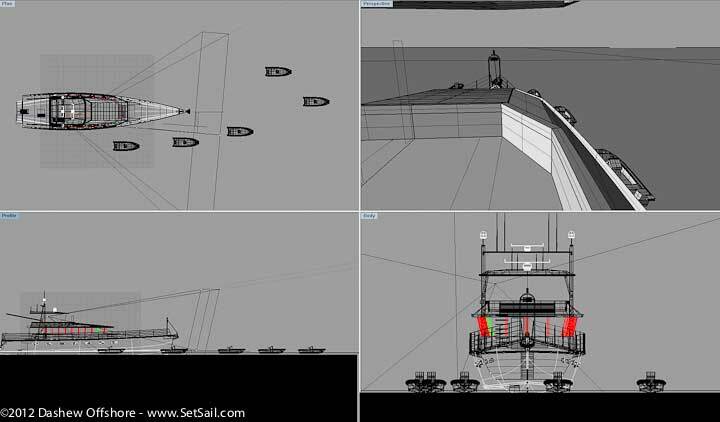 The intro drawing and those that follow were created using Rhino 3D, with an early but representative version of the Wicked FPB. We have a “camera” to check sight lines, that can be adjusted in terms of lens length (zoom) and direction of view. By varying the apex of the view pyramid, and moving the lens as you would your head, we can look at various options. 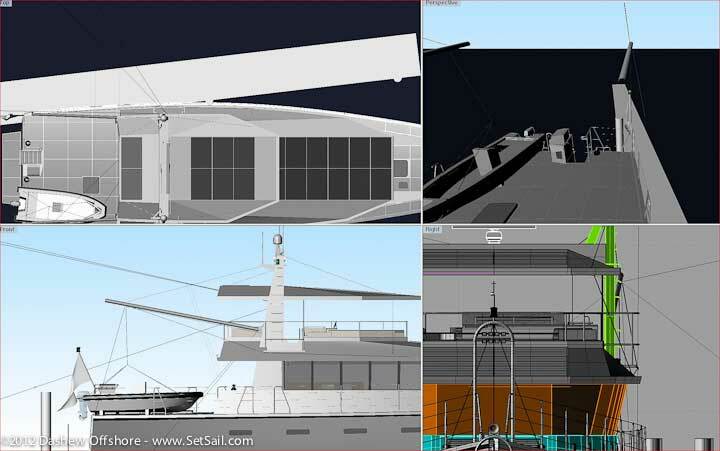 Each image is a montage of four views: upper left is looking down (plan); bottom left, side (profile), bottom right, body plan (bow); and upper right is a perspective view. 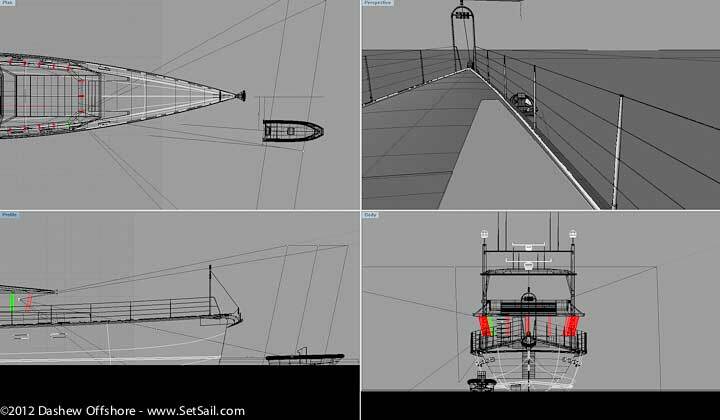 The lead image shows field of view from the as yet unnamed-deck helm position. Height of eye is 1.5m, or five feet. Note that you can see logs quite close if they are slightly off center. 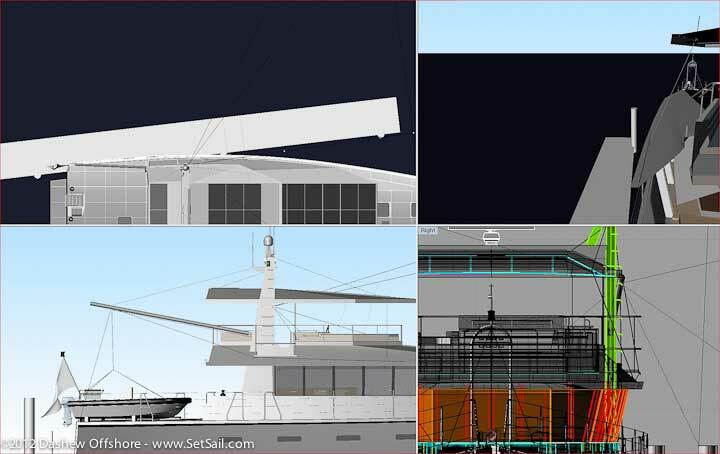 The view close to the bow is even better if you walk to the forward section of the upper deck, as in the drawing above. The same logs, now looking from the forward end of the great room. Same position onboard, but here checking a dinghy visibility. Back on top, checking a fleet of small boats. Now a series on docking. First: looking forward. And now looking aft. In both cases the watcher is standing to the side of the upper deck. By normal standards this is excellent visibility for docking. Moving around a bit you can see folks standing on the dock and/or the pilings. But this is far from perfect, which is where the observation platforms come into play. Let’s set the scene for what would be a normal unassisted (nobody to take a line) docking scenario. 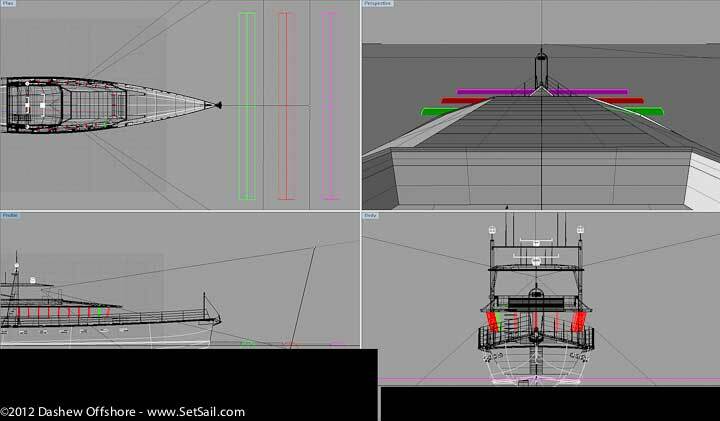 Assuming a floating – and therefore low – dock, the stern is rotated in to allow the crew with a breast line to step ashore. The con must be able to see the dock/swim step intersection, or at least the hand of the person on the swim platform. We’ve previously shown you this view from the helm position under the roof. Now let’s have a look from the docking wing. 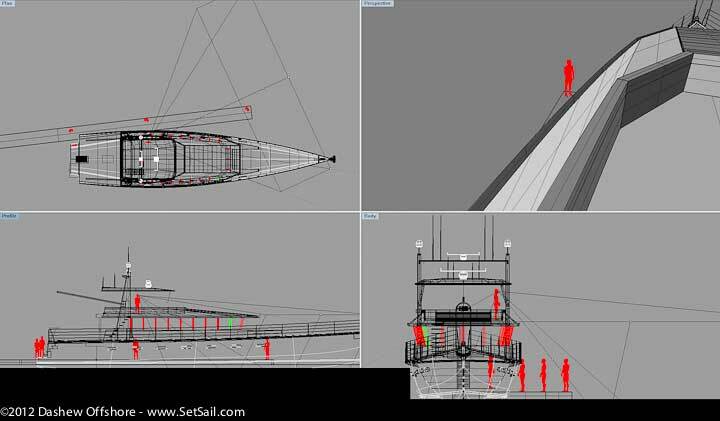 You can see the camera has been set to look from just off the mast to the top of the pilot by the stern. 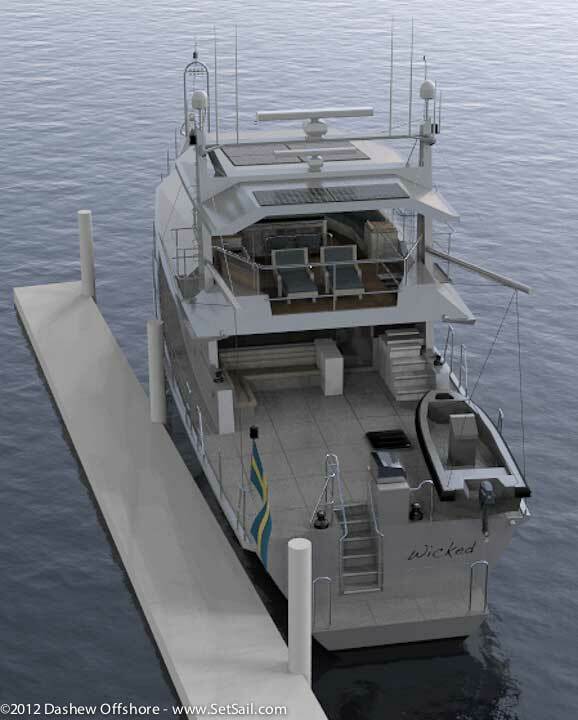 You can see the dock running under the deck flare, which makes it easy to get the swim step near the dock. Finally, looking forward from the same docking wing, this time with the camera aimed at the forward piling. To make what you see a little more clear, there is a line drawn from a mast ladder rung to the top of the piling forward. Notice that this line does not cut through any structure. Neither will your eye. 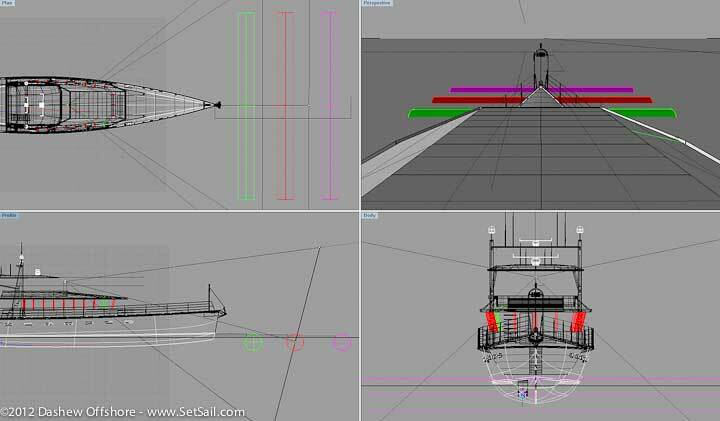 Same logic, except this time the line runs aft from the mast rung. This entry was posted on Thursday, February 9th, 2012 at 3:56 pm and is filed under FPB Series Notes, Wicked FPB 97. Both comments and pings are currently closed. Thank you Steve for the heart warming greeting on a few renderings! Wicked looks nice with some yellow and blue on the stern! Håkan, skiing in Åre, Sweden and checking setsail.com frequently to keep learning, understanding and constantly increase the interest in the design process, the new solutions and eventually the whole thing. Just as the quality of a play begins and ends with the effort spent in its writing; so to is it with design. This posting in particular reminds all of us of that. Thorough, careful thought brings pride and enjoyment later on. Are you planning on any helm controls at the wing stations? Controls are the subject of much debate. There are those who favor wired remotes and others who like wireless. This will probably end up being one of the few options. Nice logo on the house/mast side, incorporating the “Black Swan” into the FPB branding. Is there a problem with remote cameras to augment sight lines. OK as long as there is power. 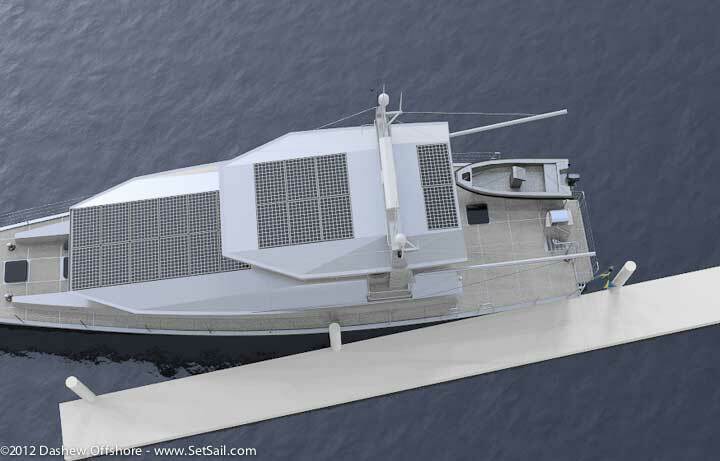 They would give close docking and maneuvering a leg up. I really like your attention to safety and seaworthy design. Some time ago I was at the Santa Babara marina and it was a beautiful day the sea was glass. Boats that must almost never go out were setting out for the channel. Most of them were top heavy and carrying a load of algae; they did not look fun or seaworthy. Not mention a waste of money. Cameras may have a place, but there is no substitute for two high resolution eyeballs connected to a multi processor computer. 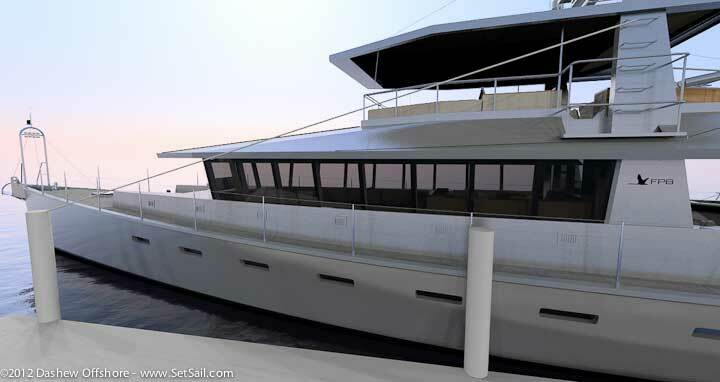 For that matter, if the simulation was sufficient, you could get the yacht in software and save ever so much fuel expense. For the same reason, as nice as your pictures are, what they really are best at is getting us to want to go see that sort of thing for ourselves. Having said that, there are people I wouldn’t trust at the controls of a nerf contraption in a padded cell, let alone your fine craft, even if the aluminum was as pellucid as thorium fluoride. Those people probably self-select away from the cruising lifestyle, although I’m sure you have a number of stories of Darwin selecting them, instead. If idiocy is defined as things you know that are not so, there are a lot of idiots who can screw up a docking just as well in plain sight as on camera. The problem with cameras is that they help you lie to yourself, by diminishing situational awareness in favor of the illusion of precision. The worst example of this was a sensor system I was exposed to in the military that had the distressing “feature” of “failing pretty”. When it would lock up, and it locked up between two and fifty-nine minutes after booting, it would look exactly like it was working…it just didn’t update. Deeply maddening to troubleshoot. It passed a “streamlined” acquisition process, and I talked to the guy who was told to accept it regardless of how it worked. It was always obsolete, but it is now out of circulation as well. Right, but many forgot they have this, they even lose the how to use it, and they forgot to make some training to allow the computer do not freeze in some unaware situation. 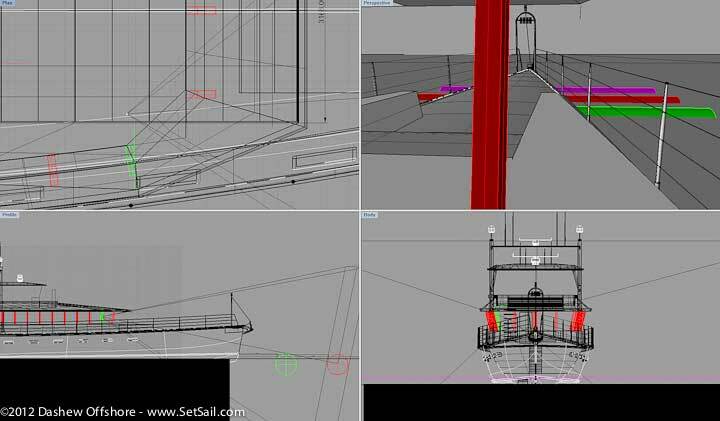 Really nice work to keep one good site view around the environment of the boat.